As the Plain Dealer News Guild decides how to most effectively pursue a grievance on behalf of 24 copy editors, page designers and illustrators whose jobs may be outsourced, the union contract itself has been extended by one year. Because the PD failed to properly and timely notify the union of its intent to bargain, the current contract will now expire on Feb. 28, 2020. Layoffs, nevertheless, may not end with the 24 employees in the Pub Hub, if indeed those positions are outsourced. As of Feb. 28, 2019 — next Thursday — a "no layoff" clause in the guild contract expires. That means that individual job guarantees for union employees, which were part of a 2012 Memorandum of Agreement, will no longer protect them. "We’re definitely worried about what the company will do next," reporter and News Guild Chair Ginger Christ told Scene. "During our most recent bargaining session, we asked the company to guarantee the jobs of a certain number of our members for another year. The company refused." Christ said that the staff is "very tense" and echoed comments from her colleagues regarding the mood of grim uncertainty at the paper. She reiterated the Guild's refrain that the paper won't be able to "cut its way to profitability." Rachel Dissell, another reporter and Guild member, said it's possible that the Plain Dealer will attempt to do to reporters and photographers what they're actively doing to designers and editors: "outsource" them to a company also owned by Advance — cleveland.com, for example. Dissell said that at this week's bargaining meeting, during which the two sides failed to reach an agreement, the Guild asked for company information so that they'd be able to determine a course of action related to their grievance. She said the Guild feels it has a strong position — their contention is that "outsourcing" the Pub Hub positions to a company that Advance also owns violates their contract — but that taking the grievance to an arbitrator is a gamble. As for next week's deadline, she said she hoped that if the PD truly felt a need to further reduce the number of local journalists, they would do so by offering voluntary buyouts to people closer to retirement age. The Guild will fight, in any case, to preserve as many jobs as possible and to enhance the benefits packages of those who are laid off, especially those with sizable gaps between now and their expected retirement age. The PD is required to provide two weeks' notice for layoffs, and no notices have yet been given, but it's possible that layoffs could be announced before the grievance is resolved one way or another. Dissell said the entire process has been frustrating. The staff hasn't been invited to participate in conversations about how to make the newsroom stronger. And the Guild's opportunity to make an official bid for keeping the Pub Hub positions, in her view, was never a genuine one. "It was always about dragging down the union," she said. If the Guild does ultimately agree to drop the grievance, the PD will have to agree to "quite a number of things," Dissell said, including enhanced severance packages, a certain minimum number of positions, and a commitment to staffing the newsroom with reporters who reflect the diversity of the region. On the controversial subject of a pledge by local unions to boycott the Plain Dealer and cleveland.com if necessary, Dissell said that she and her guild colleagues "don't take that lightly." "We believe that both entities are stronger with community support," she said. "If we have to go down that road we will, but we don't really want to. We'd much rather just do our jobs, but it's not like we have a whole lot of options." 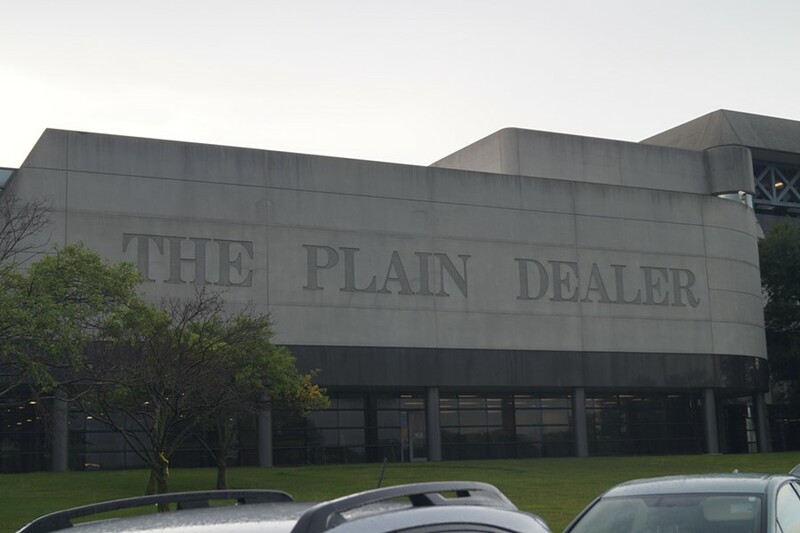 The Plain Dealer editor, George Rodrigue, confirmed that the Guild contract had been extended one year, but said it would be inappropriate to predict the outcome of negotiations. "The Guild and I share the goal of preserving high-quality local journalism at The Plain Dealer," he wrote in an email. Note: An earlier version of this story mischaracterized a comment from Rachel Dissell. She said she hoped that if the PD felt the need to reduce the size of the staff, it would offer buyouts, which are voluntary, to journalists close to retirement age. We incorrectly wrote that she hoped the PD would "lay off" people close to retirement age.